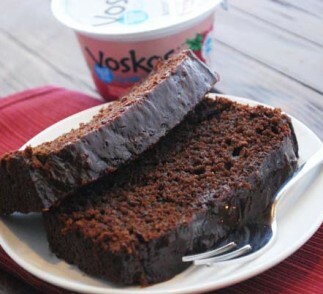 There’s nothing more decadent than the combination of chocolate and raspberry, and the velvety smooth texture of VOSKOS® Raspberry Greek Yogurt makes this cake incredibly moist and delicious. Perfect for special occasions or as a luxurious dessert, you’ll never want to settle for a store-bought cake again. Preheat oven to 350ºF. Spray a 9x5 inch loaf pan with nonstick baking spray. 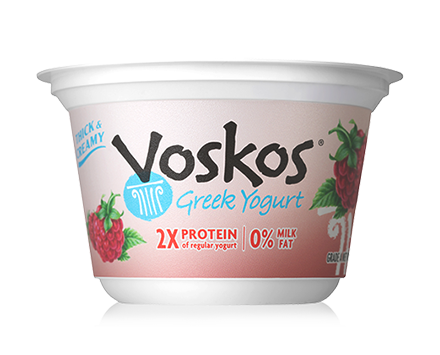 In a medium bowl, whisk together the eggs and VOSKOS® Raspberry Greek Yogurt. Whisk in the oil and sugar until mixture is smooth. Transfer the liquid mixture into the flour mixture. Mix with a spatula to combine. Be careful to not over-mix. Transfer the batter into the prepared pan, smoothing the top with a spatula. Bake 45 minutes, then loosely cover with foil and bake 15 more minutes or until a toothpick inserted in the center comes out clean. Spread the jam on top of the warm cake. Cool in the pan on a wire rack for 20 minutes, then remove from pan and cool on rack for 20 more minutes before slicing and serving.